True story: I often dream about muffaletta sandwiches. They have the perfect combination of flavors. Smoky provolone. Cured meats. Fantastic olive salad. 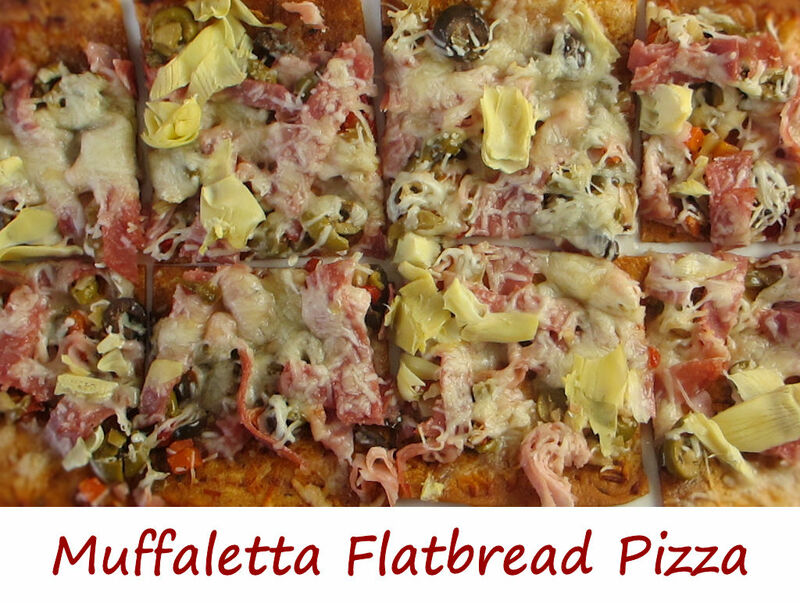 This muffaletta flatbread pizza takes all those great flavors (and more) and puts it on a bite-sized crunchy slice. Perfect for a party, perfect for any time! I make my own olive salad when I have time. It’s completely amazing, and definitely one of my favorite things to make. No matter if you use homemade or store-bought, make sure you drain the salad a bit before using it. You want a bit of the great olive oil flavor, but you don’t want a soggy pizza. 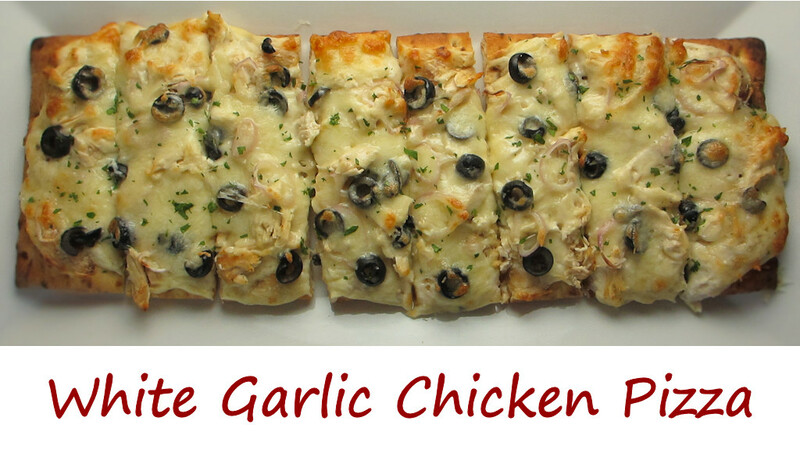 Also try my white garlic chicken flatbread pizza. For a great side dish, try my muffaletta pasta salad. Place flatbreads on baking sheets and bake for 2 minutes. Flip and bake for another 2 minutes to get crusts slightly crunchy. Remove and let cool slightly. Spread olive salad on to the flatbreads. Get a little of the yummy juice on them but not too much or they will be soggy. Bake for 10-15 minutes or until cheese has melted and crust is crunchy. Place under broiler for 30 seconds or so if you want a little char on the toppings. This white garlic chicken pizza reminded me that I really need to eat more white sauce pizza. I usually opt for red, making my own sauce, but the creamy, garlicky, cheesy sauce on this pizza was fantastic. Black olives, shallot, moist and tender chicken and Mozzarella topped it all off delicious bite-after-bite. I used chicken that I had roasted on my Char-Broil Big Easy when making this white garlic chicken pizza, but any cooked chicken will do. Grab a rotisserie chicken next time you’re at the store and shred or chop it. Perfect. Also try my BBQ chicken and muffaletta flatbread pizzas. Melt butter in a small saucepan over medium-high heat. Whisk in the flour, pepper, salt and oregano. Cook for 30 seconds. Slowly add the milk while whisking. Remove from heat and add the cheese. Stir to melt. Preheat oven per package instructions. Spread sauce out on both crusts. Add chicken, shallots and olives, followed by the cheese. Bake until the crusts are crisp, golden brown, and the cheese is melted. Garnish with parsley, slice and serve. Don’t let the fact that this French bread pizza rustica doesn’t have a sauce on it throw you off. Every bite is incredible. All of your favorite toppings, but with a little twist. Spinach. Yes, spinach. You can play around with the toppings, substituting whatever suits your fancy, but don’t leave out the spinach. 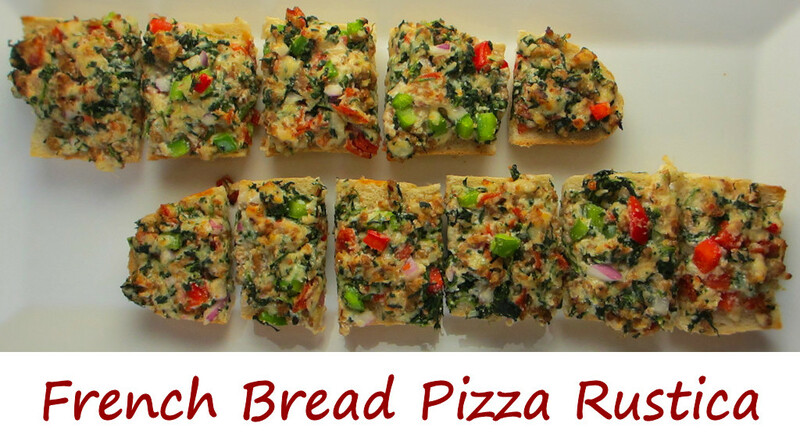 I’ve found variations on this French bread pizza rustica online, and some have you cook the vegetables a bit before putting them onto the bread. I opted to skip that step. We found the slightly crunchy (they do cook a bit in the oven) vegetables to be perfect. If you do want to cook the vegetables, just add to the skillet after you cook the Italian sausage and saute for about 5 minutes. Also make my baked Italian sub pizza. Split the bread lengthwise. Optionally, hollow out the loaf by removing some of the bread. Love toppings? Hollow it out. Want less topping? Don't hollow it out. (You might have topping left over). Crumble sausage into a large skillet with the oil and cook until done. Remove and let cool. Optionally, transfer sausage to a food processor and pulse a few times to make the meat finer. Transfer meat to a large bowl. Spread mixture out onto the bread halves. Place bread on baking sheets and bake for 10-15 minutes or until the bread is crunchy and the cheese starts to melt. Place under the broiler to brown lightly if desired.